progeCAD can be a powerful tool for creating, editing and printing AutoCAD-format DWG files for almost any version of AutoCAD. progeCAD includes multiple tools for vector-PDF import, PDF underlay and PDF printing as well. However, more than once we have been asked at CADDIT how progeCAD manages batch printing and I have agreed to write something on it. This article will offer an overview of progeCAD batch printing using the PUBLISH command. 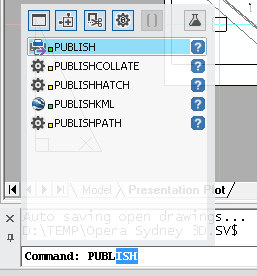 ..From the "progeCAD Button" (similar to the "Office Button")..
..By starting to type "publish" in the progeCAD Command Bar..
As one can see, there are quite a few options here to work with. The basic idea is to create a list of drawing files - either from the currently opened files in progeCAD or using the "Add Drawing" button (triangle button with the plus, above). Individual workspaces (Layouts, model spaces..) can then be added or removed from the job list using the toggle boxes next to their name in the list. For example, to only print the layout (paperspace) drawings from files above, uncheck everything in the list with name ending in "- Model". You can also re-order the way drawings are printed in the publish job by individually selecting them and using the "Move ..up" and "Move .. down" buttons. 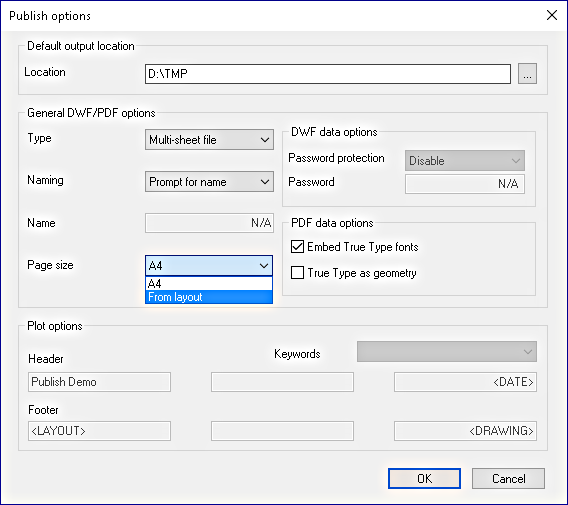 For batch printing to a PDF or DWF file, the "Default Output Location" folder would be significant. 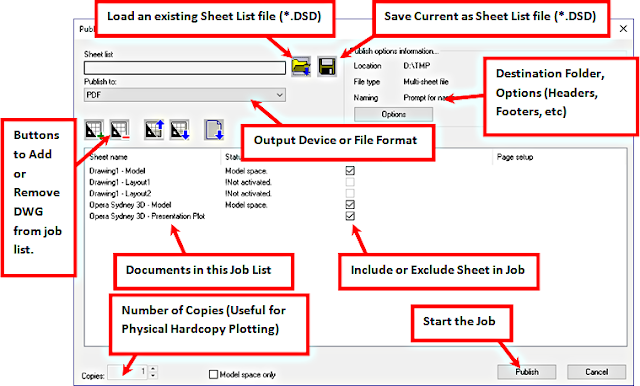 You can also specify a single paper size or allow the job to use various paper sizes as specified by each individual layout. Headers, footers, even DWF security password can be specified in this options box if the user so wishes it. 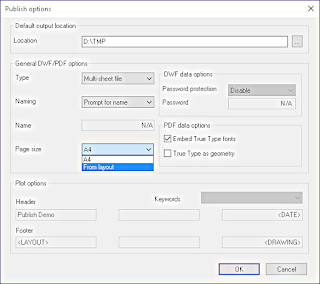 For more detail on the various options available in the PUBLISH command, we can first suggest the progeCAD 2017 "F1" included Help topics, such as "Customizing options when publishing to a file". Users are also free to post specific questions about using this or any other progeCAD command on the CADDIT user forum. For more information about how progeCAD's powerful CAD functionality save's companies thousands in CAD software costs, or for a free progeCAD trial, visit the CADDIT website.